Originally posted at 8:32 p.m. Updated at 9:22 p.m. and Updated again at 10:20 p.m.
Jordan’s Furniture, its IMAX Theatre and the Kelly’s Roast Beef were evacuated Friday night after a phoned bomb threat. FRamingham Source readers began texting about the evacuation just after 8 a.m.
Natick Police said the a staff member received a live phone call about a bomb inside the theatre, as well as a possible armed gunman in the theatre, which was showing The Jungle Book. The entire complex up on the hill, off Route 9, was evacuated just before 8 p.m.
Massachusetts State Police bomb-sniffing dogs checked the buildings for about an hour, found nothing, and allowed customers back in the building. 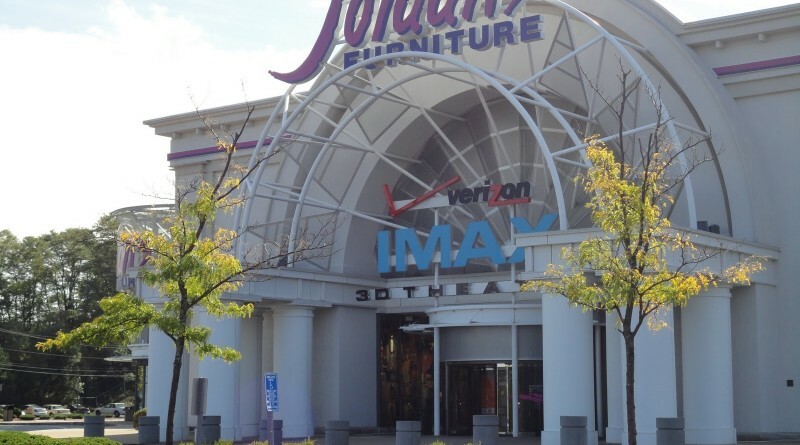 Television stations were reporting that a second bomb threat was called into the Jordan’s Furniture in Reading also.